Rita Weidinger: "Training and technology are the keys to developing the cashew sector"
Les détails sur la plus importante foire de traitement du cajou au monde, SIETTA 2016, les avis des fournisseurs d'équipements et des informations détaillées sur la transformation de la noix de cajou par des experts de l'industrie, et des recettes délicieuses et nutritives sont tous présentés dans ce bulletin. Le bulletin présente également la cérémonie de remise de la troisième édition du Programme de Maitres Formateurs (MTP), la mise à jour du marché et les événements à venir sur la noix de cajou. Ivory Coast has become the world's largest producer and exporter of raw cashew nuts, producing more than 700,000 tons in 2015. Nevertheless, similar to all cashew-producing countries, in the sub region, the processing rate of the fast growing crop is below 10% of the National production. The low industrialization of the cashew sector deprives Ivory Coast of an important additional value, thus reducing job creation opportunities. The development of local processing of cashew products has become a major objective in the country and this approach is shared by most African cashew producing countries, whose production is more than 60% of global production. To help realize the ambitious vision of President Alassane Ouattara, to ensure that 100% of the nuts produced in the country were processed locally by means of 2020 and to help promote the equipment, techniques and better profitability of processing units in Cote d'Ivoire and in the sub region, the Cotton and cashew Council (CCA) Organised for the first time in 2014, the Salon International des Equipements et Technologies de transformation de l'Anacarde - SIETTA. Building on the success of the first edition of SIETTA in 2014, the Cotton and Cashew Council (CCA) Abidjan. Under the theme: Industrialization of the Cashew sector and Citizenship for a new Ivory Coast, the event brought together more than 20 equipment manufacturers, suppliers, exhibitors and close to 12,000 visitors from the estimation of the organizers from all over the world to exhibit and sell Their equipment, meet investors from all levels of the cashew value chain and learn about the profitability of the African processing industry. In the course of the exhibition, the exhibition will be held at the end of the year. One of the highlights of SIETTA 2016 was a high-level technical meeting did Brought together experts from 11 African countries at the Palm Club Hotel in Abidjan to discuss and agree on the importance of founding a consultative platform dubbed the "Consultative International Cashew Council (CICC) ". This historic consultative platform came into being on November 17, 2016 when African Ministers signed the Convention to the International Cashew Council (CICC). This significant stride for the African cashew sector has set the foundation for future regional / international engagement and consultation of cashew producing governments. The CICC is an Ivorian initiative to provide Africa with a consultative framework for the development of a flourishing cashew production and processing industry in Africa. The CICC offers its members, national governments of cashews-producing countries, a platform to represent their interests and discuss current issues in the sector. (CAA), the Global Cashew Council under the International, is a member of the African Cashew Alliance (ACA), the World Bank, the World Bank, the African Development Bank and the EU Nut and Dried Fruit Council and the Vietnamese Cashew Association VINACAS are affiliates to the Council and act as observers and advisors to the CICC. Details of the world’s largest cashew processing equipment fair, SIETTA 2016, opinions of equipment suppliers and detailed information on cashew processing by industry experts and delicious and nutritious recipes are all featured in this bulletin. The bulletin also features the Graduation of the third edition of the Master Trainers’ Programme(MTP), Market update and upcoming cashew events. Enjoy reading the bulletin! National Farmers Day 2016 - ComCashew congratulates all farmers as we celebrate this year’s National farmers’ day! In a bid to achieve its aim of improving the livelihood of farmers through poverty reduction, the Competitive Cashew initiative organises training workshops such as the Master Training Program, to promote Good Agricultural Practices among the producers of cashew. These training programs have enabled about 414 509 farmers to increase the quantity of raw nuts they produce and hence culminated in an increase of about $161 in their income. Today, we celebrate Peter Gyan, a beneficiary of ComCashew’s training programs and other interventions. Peter Gyan is a cashew farmer in Sebreni, in the Jaman South District of the Brong Ahafo region in Ghana. Gyan, who won the Best Cashew Farmer award in 2009, first decided to become a cashew farmer in 1997 and currently owns four cashew farms, the largest of which is 42 acres large. Referring to the cashew tree ‘as the wonder tree,’ Gyan explains that cashew farming has been a very productive venture for him. Read more about Peter Gyan in page 21 of the ComCashew Newsbulletin – 6th edition on Cashew Policies and Review of Harvest Season. Agents of Change in a sector with great potential, is how Rita Weidinger addressed the 90 participants at the third and final session of the Master Training Programme, which ended on October 28, 2016. The Executive Director highlighted once more the importance of each Master Trainer in their role as experts, knowledge multipliers and individuals involved in the very promising cashew sector in the sub-region. A third generation of Master Trainers - Agents of Change - was trained in this third training edition, jointly organised by ComCashew and the African Cashew Alliance (ACA). This new generation is made up of 69 cashew experts and 20 resource persons, from 12 countries in the sub-region. Representing different professional backgrounds and working along the cashew value chain, the participants had not only a unique opportunity to gain experience and knowledge through practical and theoretical training sessions, but also through peer-to-peer learning and exchange to impact their respective fields of work. The Global Delivery Initiative (GDI) is a collaborative effort to create a collective and cumulative evidence base of delivery know-how to inform development practice and improve implementation. The GDI and its partners support practitioners on the ground to adapt to dynamic contexts and solve stubborn delivery challenges. The Initiative also aims at promoting integrated approaches of delivery by forging a global community of partners to build a more systematic, cumulative, and strategic understanding of how to deliver. One way of achieving this is through its Global Delibrary Library. The library contatins a wide variety of resources on delivery and adaptive management, contributed by GDI partners, and geared toward informing practitioners' decision-making. One of such is ComCashew's study on "How to Implement a Broad-Based Approach to Developing the Africa Cashew Market." "How to Implement a Broad-Based Approach to Developing the Africa Cashew Market." The second phase of the African Cashew initiative (ACi) came to a successful end in April 2016 to usher in its third phase as Competitive Cashew initiative (ComCashew) . Change Accompanies growth but comes with its own challenges and struggles. We appreciate your patience during this change process as love especially this edition of the bulletin Took a while to be published. This edition of The ComCashew News Bulletin is Mainly focused on cashew Policies and Review of Harvest Season. This 6 th edition thus celebrates ComCashew for winning the OECD DAC Prize Award. The Master Training Program (MTP), Which what leden ComCashew and its partners to create a pool of experts cashew in West Africa is so featured. The third edition of the program has Brought together over 90 participants from over 10 countries in Africa. The first and second sessions were held in May and August 2016. We congratulate Olam, a valued partner of ComCashew for being recognised by Fortune magazine in it's 'Change the World' list which recognises companies that have made a positive social impact through activities that are part of their core business strategy. The impact of Olam's Livelihood Charter - in which cashew and other nut initiatives play a crucial role - was recognised. The Competitive Cashew initiative (ComCashew), was one of 140 participants from 22 countries at the 2015 edition of the International Cashew Conference held in Dar es Salaam, Tanzania. The conference, which was under the theme “Cashew for Health, Wealth and Environment” provided a platform for the discussion of recent developments in the African Cashew sector. Among the wide variety of topics discussed by participants on the cashew value chain were crop improvements, protection, advances in biotechnology, value addition, technology transfer, marketing and policy issues. Over 35 oral and poster presentations were made. Comcashew's presentation on ‘Capacity development through Master Training Program for cashew value chains’ has been selected for publication in the conference proceedings following a peer review process. The Minister of Industry in Ivory Caost, Mr. Jean Claude officially launched the 2nd edition of the International Exhibition of Equipment and Technologies for the Transformation of cashew (SIETTA 2016). The colorful event took place at Hotel TIAMA in Abidjan. Dr. Ulrich Sabel-Koschella, head of GIZ regional agriculture value chain projects supported by Ms. Rita Weidinger, Executive Director of the Competitive Cashew initiative (ComCashew) represented GIZ and participated in a learning lunch organized by the Bill and Melinda Gates Foundation in Seattle. Dr. Sabel-Koschella and Ms. Weidinger made a presentation on the lessons from 7 years of implementing the African/Competitive Cashew Initiative and other regional agricultural value chain projects in cocoa, cotton, rice and coffee. Whilst companies focus on supply of specific commodities, farmers use the cash influx from these crops for a broader farming and household systems. Cashew provides a much-needed income during the so-called hungry period, giving high leverage for an increased family income - for inputs for annual crops and school fees. The Bill & Melinda Gates Foundation was a major funding partner of the African Cashew initiative (ACi), now known as, Competitive Cashew (ComCashew) for its third phase of implementation. Christian Merz, who is now programme manager at the Gates foundation, and previously with SAP, explained SAP’s successful collaboration with ACI for tracking sourcing from individual farmers using IT solutions. The occasion was also used to present replica copies of the DAC prize ‘Taking innovation to scale’ which ACi received in April 2016. Ivory Coast, the world's biggest cocoa exporter has just overtaken India to become the world's biggest exporter of cashew nuts, too. Mr Fredric Alipui, a Policy Advisor at the Ministry of Trade and Industry, has called for the establishment of an Economic Community for West African State (ECOWAS) Cashew Market to make the crop competitive in the sub-region. President John Dramani Mahama has pledged to support cashew farmers to achieve their production levels and ensure availability of the cash crop for both domestic industries and export. Within the framework of the Benin-based project Promotion of Agriculture (ProAgri), measures are being implemented to strengthen producer organisations in the cashew value chain. Besides offering advice to partner structures on cultivation, harvesting and processing issues, capacity building is being provided in the fields of organisational development and marketing. This job requires frequent travel both into the countryside and throughout Benin, along with occasional trips to Accra. The position is based in the regional programme office in Parakou. Along with directly advising partners, the position involves organisational and concept-related tasks. This job comprises providing support to partner organisations (umbrella associations and cashew producer cooperatives) in terms of organisational and strategic development, preparing business plans, marketing tools, contract farming, PPP, capital mobilisation and member loyalty. This will require coordination of activities with other donors and projects in the cashew value chain. Strengthening relationship with farmers is the best way to secure supplies, whether cashew, cotton or cocoa. "He who controls the production control the market," says Theodore Partheeban, Sr Vice President at Olam International. Check out The International Journal for Rural Development - Rural21's, feature on the African Cashew initiative, for winning this year’s OECD-DAC prize. The Development Assistance Committee (DAC) of the Organisation for Economic Cooperation and Development (OECD) awards the prize as recognition of innovative approaches that have gone beyond the pilot phase to reach wider application. The African Cashew initiative (ACi) says the cashew crop sector represents real potential for development, value creation and the fight against poverty in rural areas. Ms Rita Weidinger, Executive Director of African Cashew Initiative (ACI), has called on African governments to invest in the production and policy development of the cashew sector, to increase economic value and enhance private investment. The government of Ghana has assured of working to end the challenges confronting the country’s cashew industry where about ten thousand jobs are reported to have been lost. In spite of the unduly lower share of investment in the country’s cashew production sector from government, the sector still holds much potential as it is seen to be one of the most promising economic boosters -- capable of generating between US$400 and US$500million revenue for the country and improving livelihoods of many rural women farmers. The Minister of Trade and Industry, Mr. Ekow Spio-Garbrah, on Thursday, April 2016 announced that the Government of Ghana would come up with a memorandum of understanding (MoU) within the next 60 days to outline measures to promote the production, sale and processing of cashew nuts in the country. The Minister said this during a visit to USIBRAS, a Brazilian-owned cashew processing plant in Prampram, Ghana. Adopting Good Agricultural Practices results in a better quality of raw cashew nuts while stable, reliable linkages between farmers, processors and buyers is extremely essential for the competitiveness of African cashews. These are the lessons the German International Cooperation (GIZ) project African Cashew initiative (ACi), the Sustainable Trade Initiative (IDH) and the Mennonite Economic Development Associates of Canada (MEDA) learned from years of implementing cashew sector interventions. The ACi Cashew Matching Fund was launched in September 2012 to leverage contributions from Processors, Farmer Based Organisations and Buyers and/or Retailers, as well as Public Research Institutions, to enable them to implement specific interventions or actions that lead to desirable outcomes for the cashew sector. The ACi Cashew Matching Fund is a unique public private partnership model and the only fund for cashew worldwide. The Cashew Matching Fund is managed by the African Cashew initiative (ACi), and commissioned by the German Federal Ministry for Economic Cooperation and Development and the Bill & Melinda Gates Foundation with participation by IDH – The Sustainable Trade Initiative and MEDA. The ACi Cashew Matching Fund supports activities in either Improved Cashew Planting Material or Strengthening the Supply Chain of African Cashew. After the first call in September 2012, and subsequent calls in 2013 to date, there are presently 27 farmer linkage and research projects, with over 40 partners implementing projects amounting to €9.76 million out of which €3.91 million is contributed by the Matching Fund Grant. Through the Fund, about 180,000 cashew farmers are supported in six countries – Benin, Burkina Faso, Côte d’Ivoire, Ghana, Kenya and Mozambique. Call for Concepts or Full Proposals from 23rd March to 15th April 2016, followed by review and decision making from 25th to 29th April 2016. Contracting of successful projects will be done thereafter. Project implementation commences from 15th May 2016. V. Improved market access (access to price and production information, etc. During the last 5 years a traceability system was developed under the umbrella and with endorsement of the African Cashew Initiative (ACi) . The system is called 3S and stands for Sustainable Supply System. It is currently being implemented by front running processors in Africa. The 3S traceability system is a pre-competitive system that is governed by a separate foundation called the Sustainable Nut Initiative (SNI), in which all participants are represented. It is still closely linked to ACI. 3S stands for Sustainable Supply System. 3S is a Management Information System initiated by the Sustainable Nut Initiative (SNI). It is a secure, online software platform to manage and share product, process and supplier information, from raw material to finished product. 3S helps monitor and manage value chains by linking data from all actors. Benchmarking and impact analysis in the entire supply chain provides essential management information. Depending on agreements between the partners in the chain, information is made available to each other. This type of information is key to steer productivity and to improve quality (see http://www.supply3s.com/). All activities related to Expected Results I and II are eligible to applicants operating in Burkina Faso and Ghana (funded by MEDA and GIZ). Activities related to Expected Results III to VI are eligible to applicants operating in Benin, Burkina Faso, Côte d’Ivoire, Ghana and Mozambique. € 1.5 private funding (60%) for projects. This holds for private applicants. With regard to public institutions, we target a ratio of 50% - 50%. establishing seedling distribution centres (CDNs). Please download and complete Application Forms from www.africancashewinitiative.org and submit electronically with all attachments to cashewfund@giz.de. In case of any questions please contact us through same email-addresses. The prize was awarded by the Ministry of Commerce in Ivory Coast. ACi congratulates AFRICAJOU and wishes it the best in all its endeavours. L'adoption de bonnes pratiques agricoles assure une meilleure qualité de noix de cajou brutes, tandis que des liens stables et fiables entre les agriculteurs, les transformateurs et les acheteurs est extrêmement essentiel pour la compétitivité de noix de cajou d'Afrique. Ces sont les enseignements que le projet de coopération internationale allemande (GIZ) initiative africaine de cajou (iCA), l'Initiative pour le commerce durable (IDH) et Associés Economique des Mennonites (MEDA) tirées des années de mise en œuvre des interventions du secteur de cajou. Le Fonds de contrepartie de cajou de iCA a été lancé en Septembre 2012 pour tirer parti des contributions de processeurs, les organisations agricoles et les acheteurs et / ou détaillants, ainsi que les institutions de recherche publique, pour leur permettre de mettre en œuvre des interventions ou des actions spécifiques qui conduisent aux résultats souhaités pour le secteur de cajou. Le Fonds de contrepartie de cajou d’iCA est un modèle de partenariat public-privé unique et le seul fonds pour le cajou dans le monde entier. Le Fonds de contrepartie est géré par l'initiative de Cajou Africain (iCA), et été mandatée par la Fondation de Bill & Melinda Gates et le ministère fédéral de la Coopération économique et du Développement avec la participation de IDH - L'Initiative pour le commerce durable et MEDA. Le Fonds de contrepartie de cajou d’iCA soutient la mise en œuvre des activités dans le cadre de matériels végétales améliorés ou de renforcement de la chaîne d'approvisionnement de cajou africaine. Suite au premier appel en Septembre 2012, et les appels suivants en 2013 à aujourd’hui, il y a actuellement 27 projets des liaisons entre producteurs et acheteurs ou transformateurs et de recherche. Plus de 40 partenaires mettent en œuvre des projets d'un montant de 9,76€ millions dont 4,32€ millions est apporté par le Fonds de contrepartie. Grâce au Fonds, environ 180.000 producteurs de cajou sont soutenus dans cinq pays - le Bénin, le Burkina Faso, le Ghana, le Mozambique et la Cote d’ivoire. Appel des concepts ou des propositions complètes, du 23 Mars au 15 Avril 2016 suivie d'une période d'évaluation des propositions et de prise de décision, du 25 au 29 Avril 2016. La passation de contrats des projets retenus seront faits par la suite. La mise en œuvre du projet commence à partir du 15 Mai 2016. Au cours des 5 dernières années, un système de traçabilité a été développé sous l'égide et avec l'approbation de l’initiative du Cajou Africain (iCA). Le système est appelé 3S et représente le système d'approvisionnement durable. Ce système est actuellement en cours d’exécution par les transformateurs en Afrique. Le système de traçabilité 3S est un système précompétitif qui est régie par une fondation distincte appelée Sustainable Nut Initiative (SNI), dans laquelle tous les participants sont représentés. Il est encore étroitement liée à l'iCA. 3S signifie Système d'approvisionnement durable. 3S est un système d'information de gestion initié par Sustainable Nut Initiative (SNI). C’est une plate-forme logicielle sécurisée, en ligne pour gérer et partager des produits, des processus et des informations des fournisseurs, de la matière première au produit fini. 3S permet de surveiller et de gérer les chaînes de valeur en reliant les données de tous les acteurs. L'analyse comparative et analyse d'impact dans la chaîne d'approvisionnement et fournit des informations de gestion essentielles. Selon les accords entre les partenaires de la chaîne, l'information est mis à la disposition de l'autre. Ce type d'information est essentielle pour orienter la productivité et d'améliorer la qualité (voir http://www.supply3s.com/). Toutes les activités liées aux résultats attendus I et II sont admissibles aux candidats opérant au Burkina Faso et au Ghana (financé par MEDA et GIZ). Activités liées aux résultats escomptés III à VI sont éligibles aux candidats opérant au Bénin, au Burkina Faso, en Côte d'Ivoire, au Ghana et au Mozambique. Les transformateurs qui s’appliquent doivent minimalement répondre aux normes AFS, et devraient rendre compte sur les progrès allé au-delà. Les entreprises privées participant au Fonds de contrepartie doivent payer des frais d'adhésion à l'ACA.Durée du projet de 24 mois maximum (1.05.2016 – 30.04.2018) Une demande doit être faite par au moins deux entités si elles sont deux entités du secteur privé (par exemple, un partenariat entre un transformateur et un acheteur ou un détaillant pour un projet spécifiqueLes institutions de recherche ou de vulgarisation nationaux peuvent appliquer seul, sont toutefois incités à travailler conjointement avec une entité privée. Veuillez télécharger et remplir les formulaires de demande au www.africancashewinitiative.org et soumettre par voie électronique avec toutes les pièces jointes au cashewfund@giz.de En cas de questions veuillez nous contacter par la même adresse e-mail. Cashew exporters want export ban reviewed! Cashew exporters want the government of Ghana to as a matter of urgency review the ban on the exportation of raw cashew nut out of the country.The trade ministry yesterday issued a directive that effective May 31, there will be a ban on the exportation of raw cashew nuts from Ghana. According to the ministry it will confiscate any raw cashew brought into the port for export. Read more: Review ban on cashew exports : Exporters to government. The Organization for Economic Cooperation and Development announced Wednesday at its Paris headquarters the winners of its second annual “DAC Award for Taking Development to Scale.” Judged by development professionals across the public and private sectors for their scalability and innovation, 10 finalists and three winners included a mobile payment platform, a network of plant health clinics, a cashew manufacturer and a pay-per-use solar energy provider, among others. Read more: Advice from this year's OECD prizewinners - Don't reinvent the wheel! The Minister of Trade and Industry with oversight responsibilities for trade regulations and controls under the Import and Export Law (Act 503 Section 13) of 1995 as amended in 2000, has issued the following Administrative Directive on the purchase and export of Raw Cashew Nut (RCN). The African Cashew initiative (ACi), on March 7, 2016, took part in the Earth Seed Natural Expo. The Expo, which was organized by Earth Seed, was held at the Legon Botanical Gardens in Accra. The ACi stand displayed roasted cashew nuts, cashew nut paste and Zoya (mixed grain and cashew powder) from Winker. Mim also provided dried white cashew nuts and cashew brandy for sale at the stand. Also on display was cashew honey from Cashew Trade Centre (CTC). Other cashew products that were displayed at the ACi stand were Brandy, Gin, Wine and Jam which were derived from cashew. 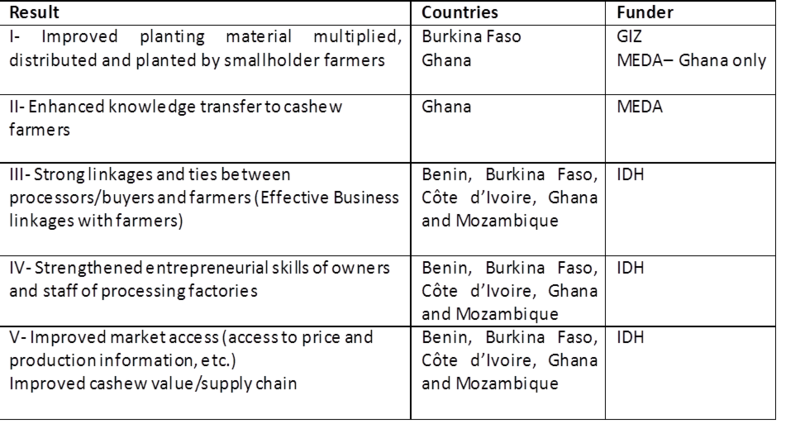 These products were made available to ACi by the Cocoa Research Institute, Ghana (CRIG). Hundreds of visitors thronged the stand to taste the cashew products on display, learn about cashew and also purchase the products. ACi personnel also used the opportunity to dispel the myth surrounding eating cashew and drinking milk by demonstrating to visitors that it was harmless to do so. Cashew apples were, therefore, made available at the stand for visitors to taste. The Natural Expo featured alternative lifestyle goods and services with the intention of educating the public on how to achieve a sustainable life in Ghana. It, therefore, served as a platform for companies producing natural products and providing services that enhance a more natural lifestyle to promote their businesses and educate visitors. Other exhibitors at the Expo included renewable energy providers, bio-waste companies, natural builders, natural healers, yogis, physical therapists, skin specialists, hair specialists, batik makers, organic farmers, vegan chefs and juice makers. The Earth Seed Expo was sponsored by Relish Health Foods, supplier of health food supplements in Ghana, Point Innovate, a solar energy provider, West African Health Organisation, a promoter of traditional medicines and HABESHA. The Organisation for Economic Cooperation and Development (OECD) aims at promoting policies that will improve the economic and social well-being of people around the world. The OECD’s Development Assistance Committee (DAC) Prize was, therefore, instituted to acknowledge the efforts of organisations which have taken an innovative approach, instrument or mechanism beyond the pilot phase to wider application. The award event is organized to appreciate projects which improve the lives of people and also bridge existing developmental gaps in society. The African Cashew initiative has since 2009, pursued the mission of improving the livelihood of African cashew farmers through aiding them to receive better returns for their produce. In 2015 ACi and its partners saw tremendous progress towards the realization of its vision: over 400,000 farmers were fully trained on two different topics, of which 22 % were women. To date, these farmers cumulatively earn an additional net income of $120 million. Also, cashew processing in Africa increased from 3% to about 10% since the beginning of the project in 2009. About 5,800 direct employments were created in the processing factories alone; women were the biggest beneficiaries taking up 75% of the total number of jobs created with accumulated wages of US$ 3.6 million in all 5 project countries. "What wonderful news – congratulations to you, Rita, for overcoming all the difficulties at the beginning of the programme, and to the entire team. 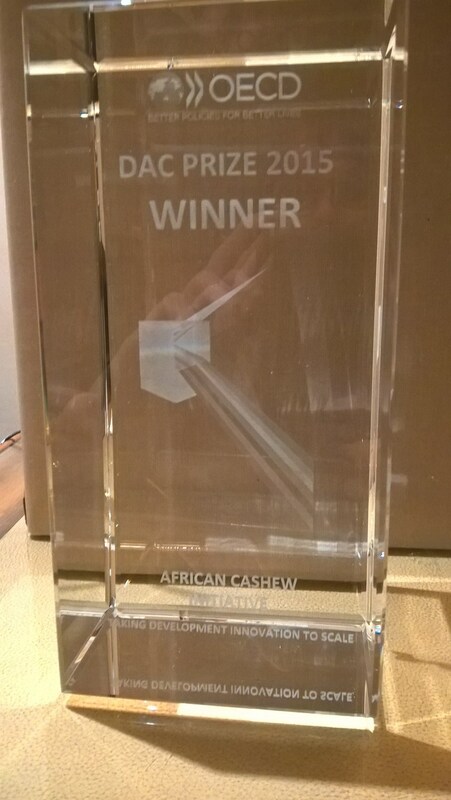 ACi deserves the prize – for its creativity and commitment to the smallholders of Africa!..." "Congratulations to all of you with the well deserved price. Your work is a good example of what a longer term view of donors, companies and a dedicated team can achieve for the benefit of a sector. Thank you for that..."
Ms. Mary Adzanyo, Director of Private Sector Development at the African Cashew initiative (ACi), represented the project in a panel discussion in Accra on March 3, 2016 on a programme dubbed “Business Advocate” on Ghana Television. The programme provides a platform for the private sector community to articulate its concerns for the attention of relevant public officials. Speaking on the topic “Strategic Support for the Cashew Industry: Prospects and Challenges,” Ms. Adzanyo urged African governments to treat cashew production and processing as a priority and strive to increase the competitiveness of the sector in their countries. She emphasized that the industry had great economic potential which would be beneficial to the continent as a whole. Ms. Adzanyo stated that ACi was established to support cashew production in the sub-region and encouraged stakeholders to think globally and learn from the experiences of other countries. According to her, the creation of an enabling environment by stakeholders for public-private investment would further enhance the development of the cashew sector in African countries. Other members of the panel were Dr. Gideon Agbley, Executive Member of the Cashew Industry Association of Ghana, Mr. Seth Osei Akoto, Deputy Director for Crops and Cashew at the Ministry of Food and Agriculture (MOFA) and Mr. Papa Kow Bartels, Director, Logistics and Value Chain at the Ministry of Trade and Industry. Mr. Akoto and Mr. Bartels stated that their respective ministries were coordinating with stakeholders to promote the development of cashew and to enhance the efficiency of the cashew sector in Ghana. The panel recommended the establishment of a cashew development levy to finance the industry. It also suggested that the government should allocate 2.5% to 5% of its revenue to subsidize the production of seedlings and enable purchase of processing equipment for the cashew industry. The African Cashew initiative recognizes the role of women in the development of the African cashew sector. The initiative believes that one way of ensuring gender parity is through capacity development. ACi interventions among other things focus on trainings and skills development of female farmers, processors and other female cashew experts. So far, 70, 756 female cashew farmers have ACi training on topics including Good Agricultural Practices (GAP) and harvest and post-harvest techniques.24 women have also graduated from both the first and second editions of ACi’s flagship Master Training Programme for cashew experts. “I am one who believes that I can perform excellently no matter where I am. I believe with focus, determination and hard work, I have made the best of wherever God has placed me and I believe anybody can do same.” This is the certainty by which one of the most accomplished women in the Ghanaian cashew sector lives. Dr Esther Gyedu-Akoto studied at the University of Ghana, where she graduated in 1992 with BSc Food Science and Biochemistry. She proceeded to do her national service at the Cocoa Research Institute of Ghana (CRIG) in New Tafo-Akim in the Eastern region of Ghana. After she had finished with her national service, she became an assistant researcher in the New Product Development Unit at CRIG. Between 1997 and 2000, Dr Gyedu-Akoto studied for and obtained an MPhil in Food Science at the University of Ghana. On completion of the course, she became a Research Scientist which is the same as a Deputy Manager of the New Product Development Unit. Dr Gyedu-Akoto’s career in the cashew sector began in 2002 when the agricultural sector in Ghana started a cashew development project and CRIG was appointed as the research wing. Dr Gyedu-Akoto was selected to be the food scientist on the cashew research team. As the food scientist on this team, she worked extensively on cashew processing, including researching into and developing new ways of processing cashew nuts and apples. Her involvement in cashew research led her to conduct more in-depth study into unexplored areas of cashew research in 2005 when she decided to continue with her education. In 2005, Dr Esther Gyedu-Akoto enrolled in a doctorate degree programme in Food Science and Technology at the Kwame Nkrumah University of Science and Technology (KNUST). “Researching on cocoa had become an exhausted topic and to me, it was time to sniff around for new areas of research,” she said and thus did her doctoral thesis on the production and utilization of cashew tree gum. Her study revealed that cashew gum can be used in both pharmaceutical and food industries. After completing the doctoral study in 2009, Dr Esther Gyedu-Akoto was promoted to the position of a Senior Research Scientist. In this position, she researched further into other uses of cashew as well as good processing practices to aid the improvement of nut quality. In 2013 she was appointed as the Acting Head of the unit. Since her appointment, Dr Gyedu-Akoto has made efforts to develop a link between research and industry. She has accomplished this through the organization of trainings for processors, her fellow researchers, business owners, agricultural extension officers, farmers and nongovernmental organizations on cashew processing. Through these trainings, she educates them on new discoveries which research has made to help improve the profitability and quality of cashew and its products. Her relentless efforts to maximize benefits from cashew have led her to produce cashew jam and juice from the cashew apple. 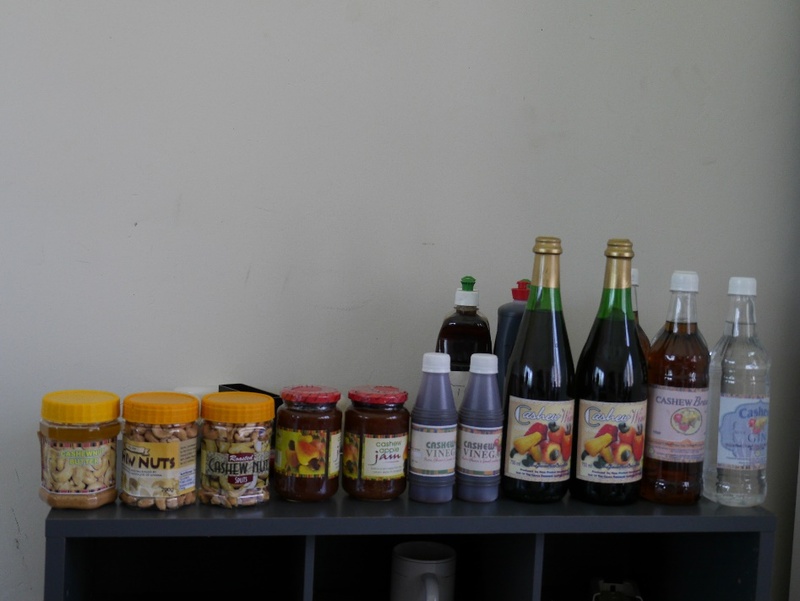 She has also worked with her team to produce vinegar, wine, gin and brandy from cashew. The team also developed a new method of roasting cashew which gave the nuts a unique taste. “The main problem I have had to face as a researcher and woman leader in the cashew sector and at CRIG is the domineering nature of some men. They think a woman’s views should not be taken seriously. They ridicule my ideas and don’t appreciate anything I do and accomplish,” she said. In spite of this, Dr Esther Gyedu-Akoto stands tall and has made significant contributions to the Ghanaian cashew sector with focus, hard work and determination. To her, opposition is not a reason to give up but rather a source of motivation to spur her on. According to Dr Gyedu-Akoto, the cashew sector is a lucrative one. However, even though many women were involved in processing cashew in Ghana, very few of them were entrepreneurs. She attributes this to a generally low level of education of women in the rural areas in Ghana. She explained that educating women would equip them with skills like account keeping and documentation of information. “Another reason which accounts for the low number of women in the cashew sector is the non-availability of financial capital for educated women who want to venture into cashew business,” Dr Esther Gyedu-Akoto added. She suggested that supporting women with financial capital and other incentives like shelling machines could help encourage women to become entrepreneurs in the sector. 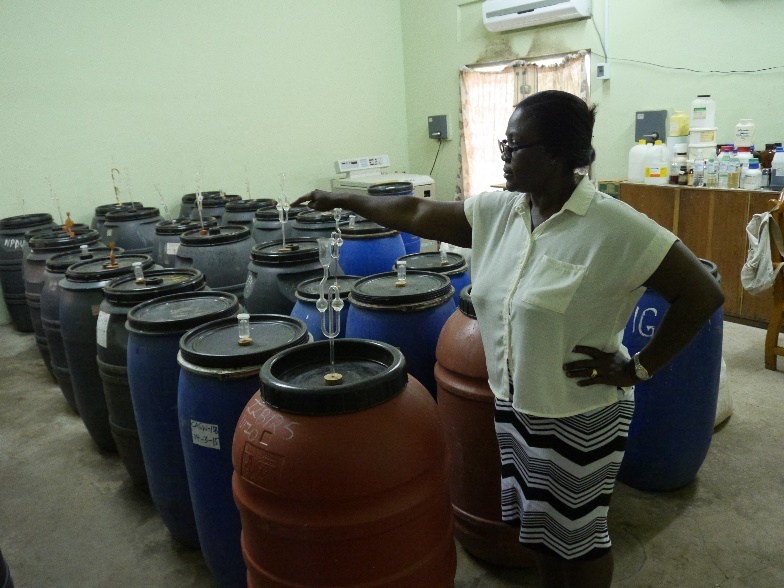 As the head of her unit, Dr Esther Gyedu-Akoto aims at creating a strong link between research and industry so that discoveries made in the laboratory would be used to improve yield, quality and profitability of cashew. Dr. Gyedu-Akoto is a mother of two and enjoys reading motivational and religious books. She aspires to own a food processing business someday. Devenir un maître formateur en cajou aujourd'hui! Les cours de MTP lient les connaissances théoriques à la pratique et ses activités techniques sont alignées avec la production, la transformation et la commercialisation du cajou. MTP 3 vise admettre 60 participants qui travaillent dans les organisations non-gouvernementales (ONG) et les organisations privées qui favorisent les chaînes de valeur du cajou en Afrique de l'Ouest. Le MTP couvre une période de 7 - 8 mois. Le programme comprend trois séances. Pour chaque séance, il y a une semaine de cours en classe qui sert comme une plate-forme d'échange. Chaque session se concentre sur quelques modules spécifiques. Le programme inclut aussi les programmes d’intersession qui permettent aux participants de s’engager dans les activités sur le terrain pendant trois mois sont prévues. Pendant les programmes d'intersession, les participants retournent à leurs institutions d'accueil pour partager leurs connaissances avec des collègues et de faire des travaux pratiques sur le terrain pour mettre en pratique ce qu'ils ont appris dans les séances de formation. Le cours est divisé en trois sessions et sera menée au Ho-Ghana, Sunyani-Ghana and Bobo Dioulasso-Burkina Faso avec l'appui expert de GIZ, FairMatch Support, Alliance de Cajou Africain et d'autres institutions et entreprises nationales qui font parti du secteur cajou. Become a Master Trainer on Cashew Today! MTP courses link theoretical knowledge to practice and its technical activities are aligned with production, processing and marketing of cashew. MTP 3 targets 60 participants working in the private and Non-Governmental Organisations (NGOs) which promote the cashew value chains in West Africa. The Master Trainer Program is also open to experienced training experts/ consultants along the cashew value chain or any other crop, staff of processing companies and independent consultants linked to agriculture in general. The MTP covers a period of 7 – 8 months. The program includes three one-week classroom sessions, offering a facilitated platform for exchange. Each session focuses on a specific set of modules. Intersession programs which allow participants to undertake field activities for three months are scheduled. During the intersession programs, participants return to their host institutions, share their knowledge with colleagues and do hands-on work in the field to apply what they have learned in the training sessions. The course is divided into three sessions and will be conducted in Ho-Ghana, Sunyani-Ghana and Bobo Dioulasso-Burkina Faso with expert support from GIZ, FairMatch Support, the African Cashew Alliance and other national institutions and companies involved in the cashew sector. experts in the design, adaptation and updating of educational/training tools. As part of measures to curb perennial non-availability of and inaccessibility to improved planting materials and subsequently to improve cashew production in Benin, ACi through a collaborative work with the National Agricultural Research Institute of Benin (INRAB) developed and implemented an accelerated cashew improved planting material program. After 5 years of hard work and cooperation, INRAB has published some of the successes and achievements chalked by the program. The agreement, which is intended to help limit global warming to a maximum of 2°C, will take effect in 2020. It will however, require all signatory states to make binding nationally determined contributions- based on different levels of ambition – to mitigate climate change. 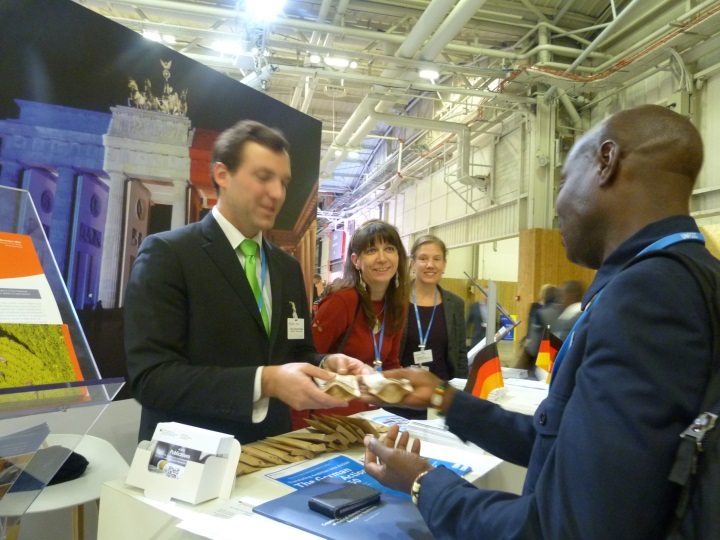 GIZ joined the German negotiating team on behalf of the Federal Ministry for Economic Cooperation and Development (BMZ); the Federal Ministry for the Environment, Nature Conservation, Building and Nuclear Safety, among others, to contribute their quota at the COP 21. 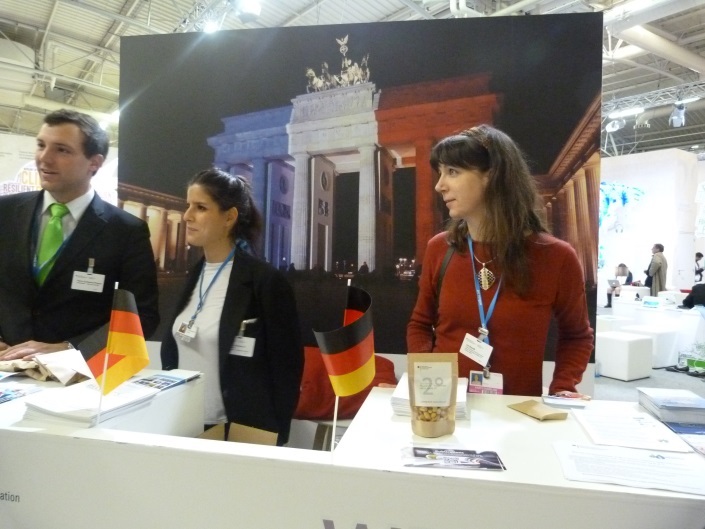 After the conference, GIZ made use of the German Pavilion – a popular meeting place at the Conference – to carry out a few engagements. Small bags of cashew nuts grown in Africa were distributed among those present. The nuts which were sponsored by BMZ with the support of the African Cashew Initiative (ACi) and its two partners, Intersnack and the Trade & Development Group (TDG), were highly appreciated. The meeting at the German Pavilion also paved way for the German visitors to make valuable contacts and develop ideas for future projects and initiatives. Harrison Hamidu is the owner of a 5-hectare cashew farm in Tuobodom, in the Brong Ahafo region of Ghana. In 2013, the 32-year old farmer became a beneficiary of ‘Raising Farmer Livelihoods in Ghana’, a program which was put in place by Olam Ghana to improve the livelihood of farmers. By virtue of his membership, Mr. Hamidu has received training in the three stages of Good Agricultural Practices on cashew farms. According to him, he has derived very useful benefits from his participation in this program. Apart from experiencing an increase in yield, he has also learnt about the positive implications of pruning for his farm. Pruning does not only keep his farm clean and highly productive but also provides him with additional income as he transforms the pruned tree branches into charcoal and sells them. Based on the knowledge Mr. Hamidu acquired from the trainings, he decided to cultivate two hectares of grafted seedlings because they were pest-resistant and would last longer. Due to the existence of the Olam Livelihood Charter (OLC), he was provided with free grafted seedlings. Having developed a trustworthy and beneficial relationship with Olam, Mr. Hamidu sells all his Raw Cashew Nuts (RCN) to Olam through the local farmer association. To him, the association has a better collective bargaining power since he receives a fulfilling amount for his cashew. Having been forced to drop out of school due to financial constraints earlier in life, Mr. Hamidu’s success in cashew farming has presented him with the opportunity to continue from where he left off. He is ,presently, a first year BSc Administration student at the Valley View University. His income from cashew farming does not only enable him to pay for his education but also helps him pay farmhands to keep the farmwork going. “Nothing motivates me more than cashew farming,” Mr. Hamidu said. ACi is very proud to become a member of the INC and looks forward to a fruitful collaboration. For more information on the INC, please visit their website www.nutfruit.org. The theme for TIFI 2016 – Cashew Session is “Boosting Local Production and Processing of Cashew Nuts”. With confirmed participation from global investors and funding institutions in control of more than US$200 billion, the TIFI 2016 will see the biggest congregation of serious investors in Tanzania. Agriculture has always been at the centre of Tanzania’s economy and Tanzania offers some of the best agricultural investment opportunities in the world. The Cashews Session will showcase investment, funding and partnership opportunities in Tanzania’s Cashews Sector.